Style: 2 Story "252 sq.ft Roof Top Terrace"
Bedrooms: 2 "King Bed - Master Bedroom"
Size: 794 sq. ft. "633.50 Living Space and 160 sq.ft balcony, 252 sq." Year Built: 2008 "Finished Jan 2008"
These ocean view condos have been built near the upscale Vista Marina development in Playas del Coco, Guanacaste. This 2 bed/2 bath condo has just been furnished to a high standard and equipped with modern up to date appliances. 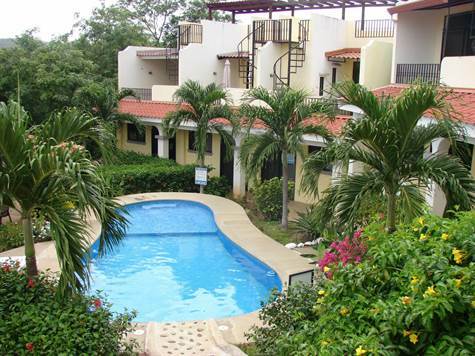 Vista Perfecta is located about 5 minutes from the beach, 3 mins from Automercado Supermarket. There is 633.50 square feet of living space under air-con and a 160 square feet balcony off of the upstairs bedroom. 252 sq.ft roof top terrace. The unit has one 18,000 BTU downstairs and one 9,000 BTU air-con in upstairs bedroom, ceiling fan in the living room, Infra red built-in stove, Italian built-in oven, two 32" Flat Screen HD TV, etc. All imported modern, oriental style furniture. The ceilings are 10ft high and there is a spectacular view of Coco Bay from the upstairs bedroom and the balcony. There are only 13 units in the development with a swimming pool and guard house/BBQ area. The property comes with the installed kitchen cabinetry and granite counter tops and full furniture package worth $18K. ▪ The Best Value for Money!!! ▪ Close offers only, please!